From 2015 to 2019 more than a million refugees and migrants arrived on the Greek islands. While many made their way to other European countries, there are approximately 62,000 asylum seekers and refugees still living in Greece. Currently, thousands of refugees are “stuck” on the Greek islands waiting for asylum procedures and arrivals to the islands have increased in the latter half of 2017 with an average of 3,000 refugees arriving each month. There are almost 9,000 people in need of international protection on Lesvos, one of the largest of the Greek islands. HIAS, in partnership with IRUSA, assists asylum seekers at all stages of their asylum proceedings. 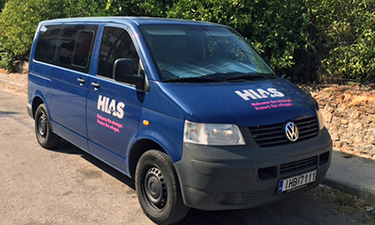 Since 2016, HIAS has assisted on more than 250 cases on the island of Lesvos, with the majority of beneficiaries coming from Syria, Afghanistan and Iraq. Additionally, HIAS represents asylum seekers from several other countries including people fleeing various parts of Africa. Clients are considered on a case-by-case basis, and the organizations prioritize vulnerable individuals who are in greatest need of legal representation. 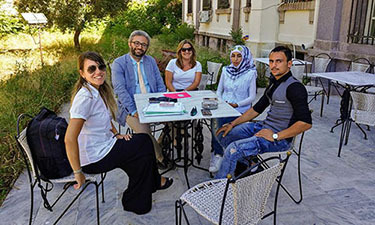 HIAS, with the support of IRUSA, is a leading legal service provider on the island of Lesvos and opened an office in Athens in 2018 to follow up on cases, pursue strategic litigation and engage in advocacy on behalf of refugees. With little legal help available for refugees and asylum seekers across Greece, HIAS plays a critical role helping refugees secure legal status, the first step toward regaining control and stability in their lives. Legal status helps refugees unlock access to a wide range of opportunities and rights helping them move toward meaningful social and economic integration. HIAS and IRUSA partner to provide free legal assistance for asylum and family reunification proceedings. The legal services include representing asylum seekers during their admissibility hearings and eligibility hearings and in obtaining necessary authorizations to access their legal and social rights in Greece. Additionally, HIAS provides group legal information sessions and engages in strategic litigation. HIAS’ global refugee law experts have developed the framework for the HIAS program in Greece based on best practices and extensive field experience. In January 2018, HIAS and Islamic Relief USA (IRUSA), the U.S. arm of the humanitarian assistance and advocacy organization, announced a joint initiative to provide improved legal services to refugees in Greece in 2018. The partnership, called the Greece Refugee Rights Initiative, was developed in response to the growing humanitarian and legal challenges for refugees.